Four picturesque beamy cottages strewn beside a reedy lake form a pleasant and informal grouping in a superb setting on the edge of the village, with open southerly views across a small lake to rolling countryside. Four picturesque beamy cottages strewn beside a reedy lake form a pleasant and informal grouping in a superb setting on the edge of the village, with open southerly views across a small lake to rolling countryside. The ambiance, tranquility and setting with each property commanding its own privacy and individuality ensure guests’ satisfaction for a relaxing and memorable stay having such appeal that over 30% of guests regularly return. Beechcroft is an outstanding example of rural preservation, in unique contrasting countryside – hills, downs and a ragged coastline, close to historic 1066 Country with a multitude of ancient castles, renowned open gardens and National Trust properties to visit, conveniently situated for the open air opera at Glyndebourne. Explore the picture book Sussex towns and villages or spend time on the local beaches. 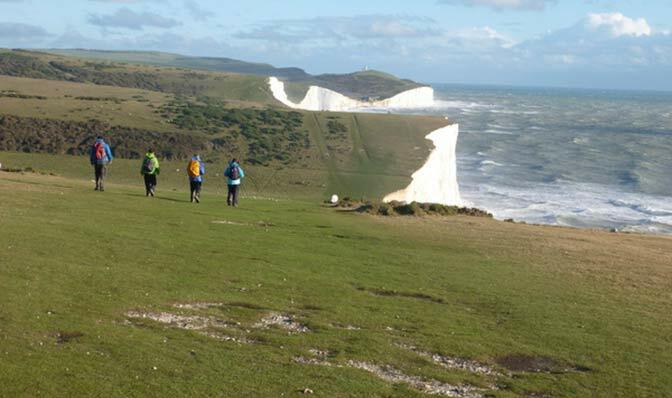 From tranquil gardens, Norman’s Bay, the Cuckmere Haven Nature Reserve and the steep ascent of the South Downs, there is an abundance of leisure interest in this unspoiled area with some of the best walking and off road cycling in the country. Local hostelries with good food, farmer’s markets and farm shops are in abundance. Fresh seafood from the coast is a speciality. Top quality cottage, excellent base to visit many National trust/ English Heritage site. Sampled many of the local pubs – excellent food. Pure comfort, peaceful and lives up to it’s reputation. Will return and recommend! Mr & Mrs M, Kent. Just perfect, so comfortable and relaxing in beautiful surroundings, love it here!! As always, (how many years now?!) the best of comfort and ambience. Opera’s lovely, many thanks once more, see you next year we hope. Fantastic cottage – perfect for a relaxing break. Merrie Harriers a must! And if you like cider – Middle Farm is fab. Thank you for such a warm welcome…we will be back! Mr & Mrs C, Buckinghamshire.